This week I have been practicing baking with my new bread maker. Needless to say the local ducks have been very well fed and so far I have failed to produce anything remotely fit for the family. These failures worked in our favour today however, as I had lots of loaves of bread sitting around just waiting to made into our new sensory play, an Edible Sand Box. After a good browse on Pinterest I decided to make some edible sand. 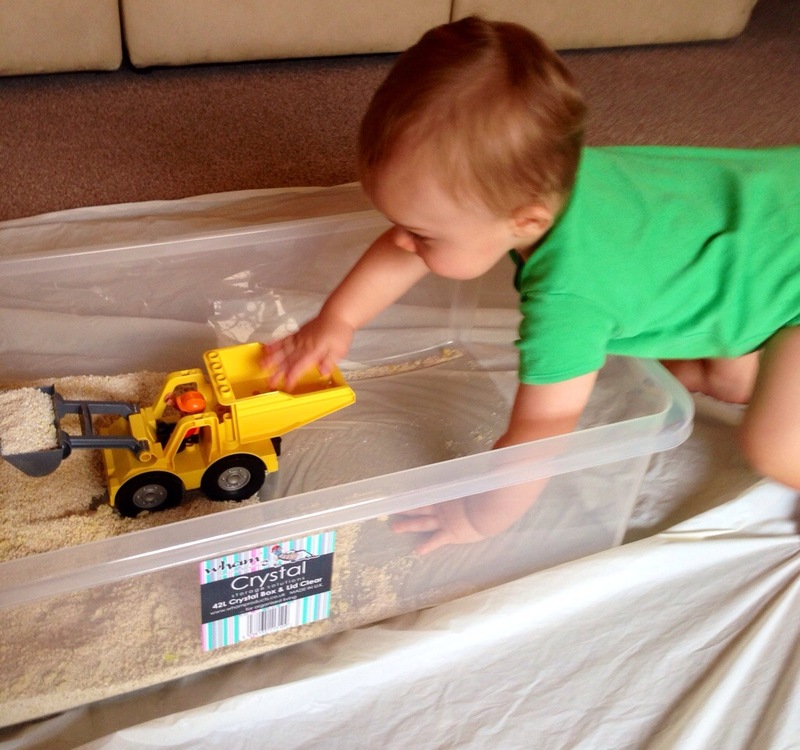 Hands On As We Grow – Indoor, edible sand box Thanks for the oatmeal inspiration! 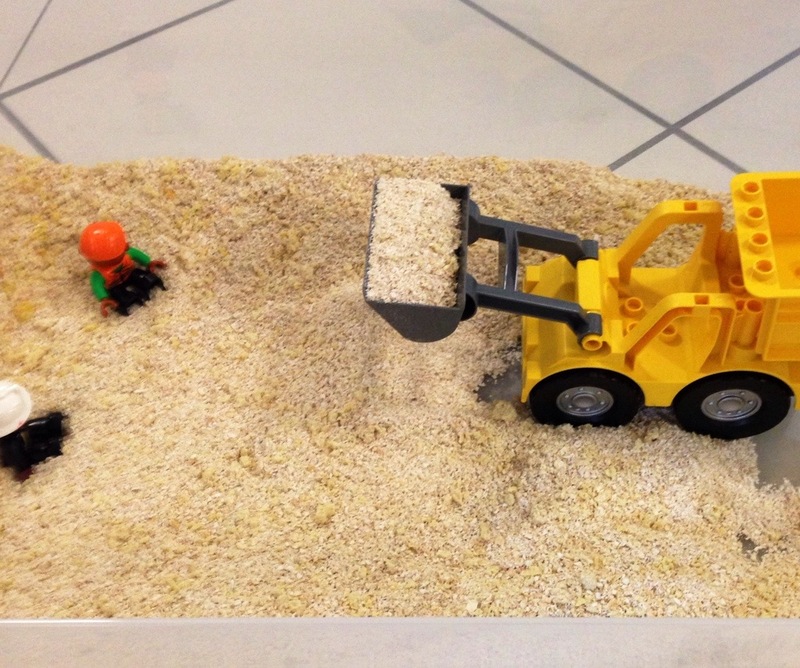 Happily Ever Mom – Edible sand for babies I never would have thought to turn the sand into a building site without this post. 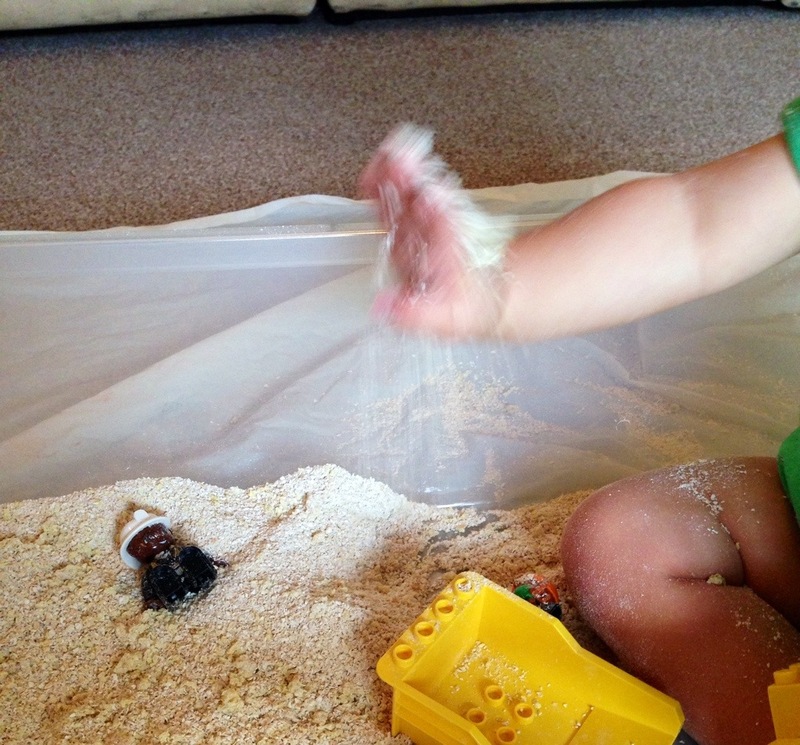 Fun at Home With Kids – Edible pretend snow For the inspiration to use bread crumbs, which added a lovely texture. I blended a bag of porridge (oatmeal) in the food processor. I had to do this in quite a few batches as my food processor is about a million years old and tiny. I then blended a few of the terrible bread loaves I have made in recent days. Fortunately, they tasted much better when they were blended. I added a few drops of yellow natural food colouring to the bread crumbs to brighten the colour. I set this up whilst Buddy was napping. When we came downstairs his eyes lit up and he was immediately squirming for me to put him down so that he could investigate. Of course, I obliged. Buddy had a quick taste test and then dived straight in. Buddy had fun burying the Lego construction men in the sand and digging them back out again. 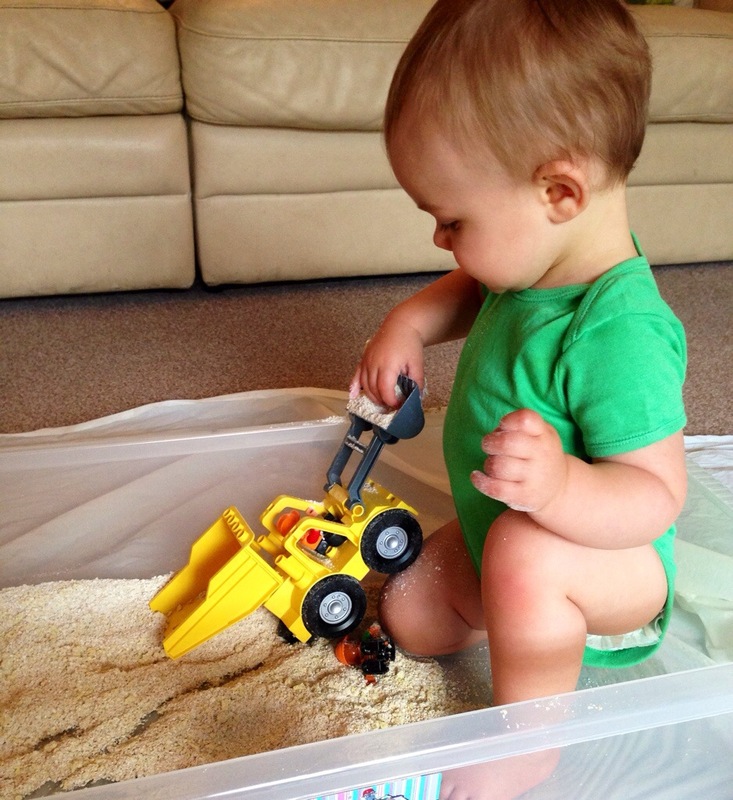 He then spent some time examining the digger scoop and spilled sand all over himself. 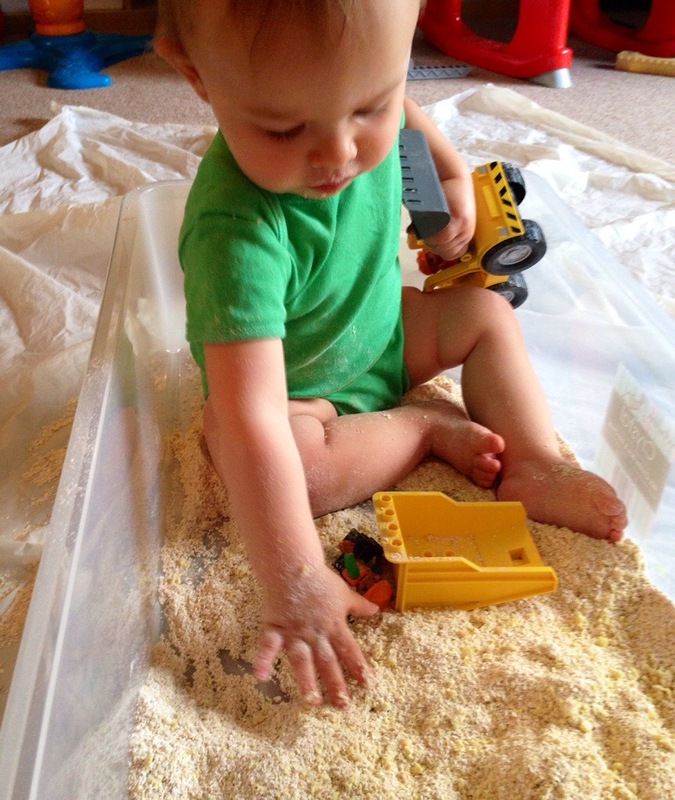 He then scooped the sand with the back of his hand and let it flow between his fingers. You can see from his face that he loved the sensation. 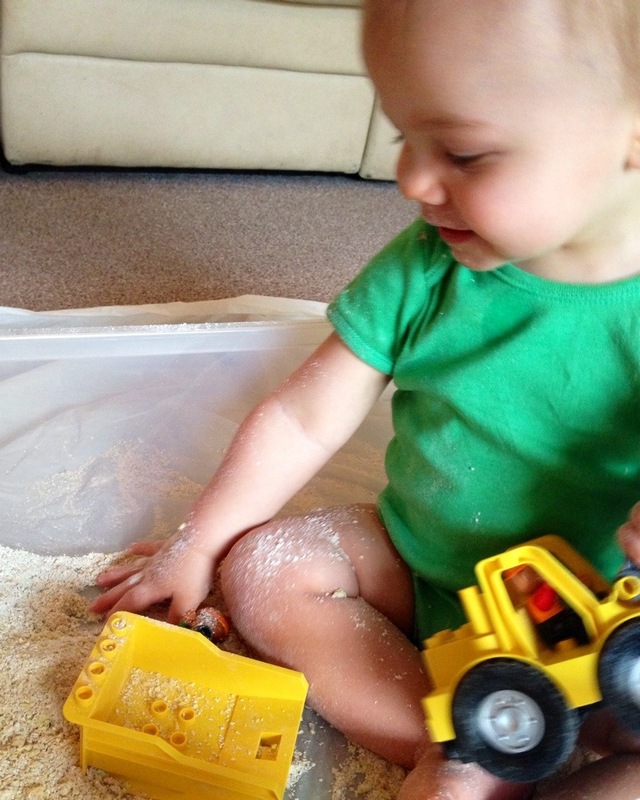 Buddy then scraped his fingers through the sand, scooping it on to his lap. 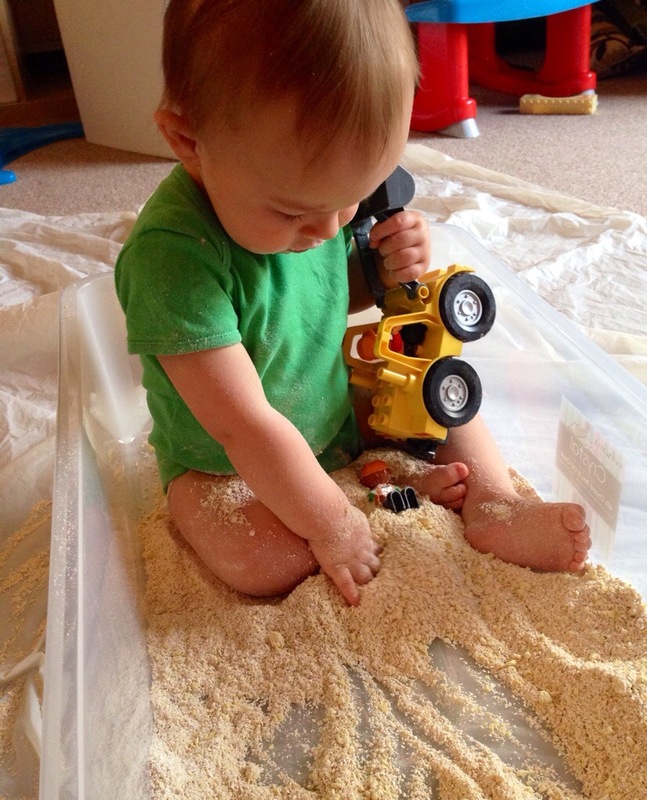 He enjoyed making lines in the sand with his fingers, making pretty patterns. We had lots of fun with hardly any mess. Bonus! I buy a kilo of porridge oats for 90 pence. I used about half a kilo. The bread adds a nice sensory element however it does shorten the lifespan of the sand. 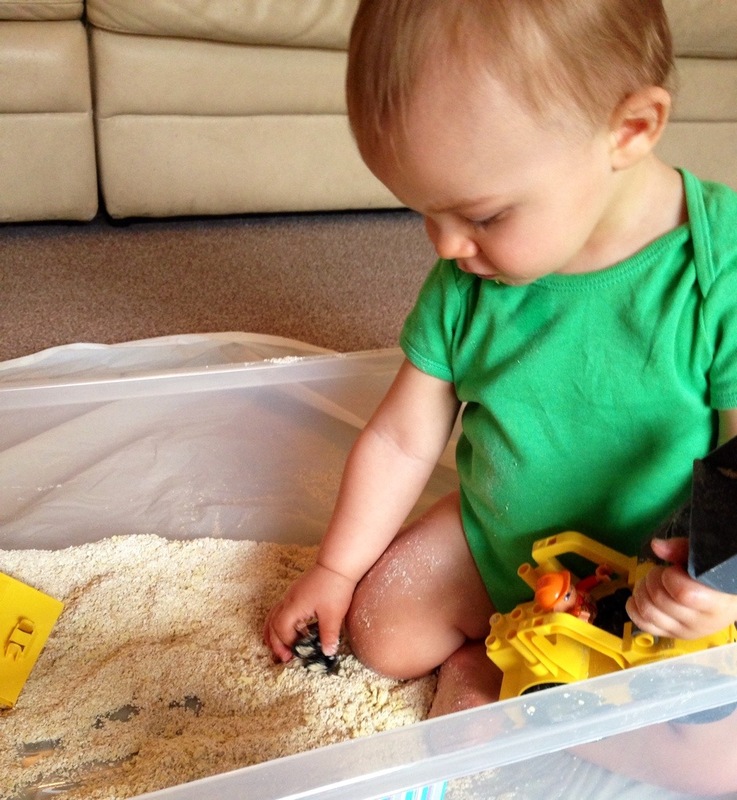 If you just use porridge oats the mixture is useable until the expiration date on the packet – as long as no dirty nasties have crept in during play. Using bread will shorten the lifespan significantly and the mixture will only be useable for a day or two. Please use your own discretion and common sense for the longevity of this material. 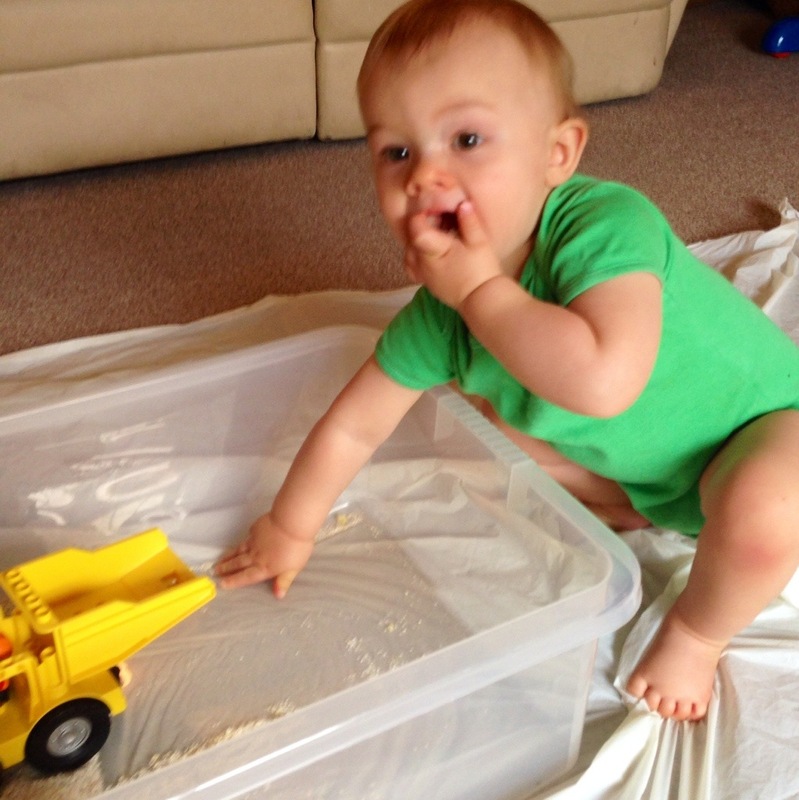 I was planning to follow this up with water play, mixing water into the oats and making a lovely gooey, goopy dough. However, after lunch Buddy was too tired to play again. Maybe next time. 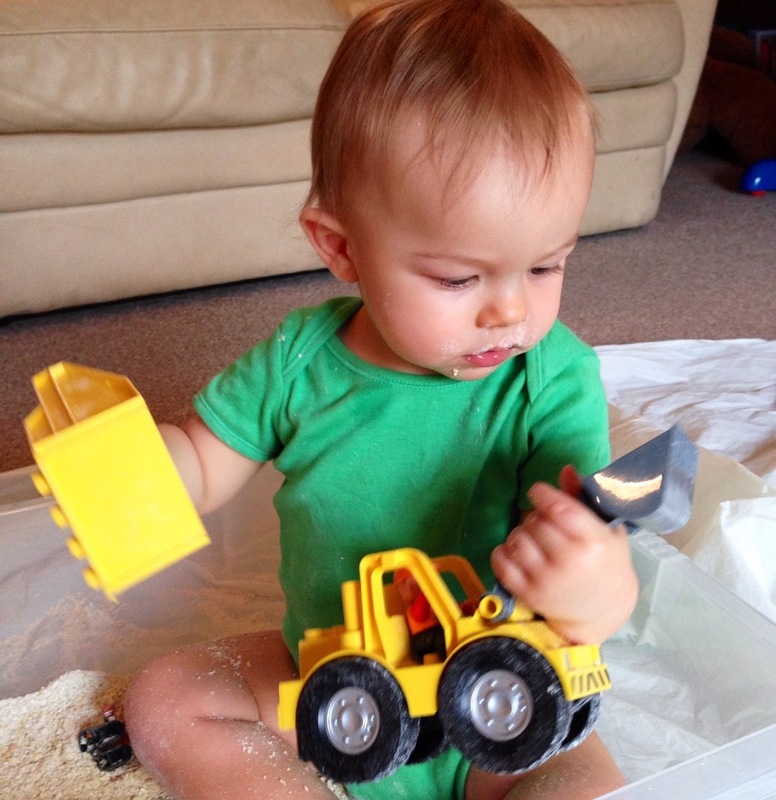 Buddy worked on his fine and gross motor skills today. He was also practicing emotions and discovering texture. What a fun way to learn all of that! 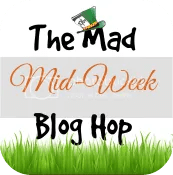 I have shared this blog post on the Blog Guide – Arts and Crafts Link up and the Mad Midweek Blog Hop #mmwbh. Why not check them out? I’m glad you liked it. Buddy certainly loved it! Aw thank you. Yep Buddy adores mess! We did get as far as adding the water for the wet version but then Buddy went for adorable and lovely to half gremlin half troll, which is his tired behaviour! Never mind there’s always next time! Edible sand! What a brilliant idea! 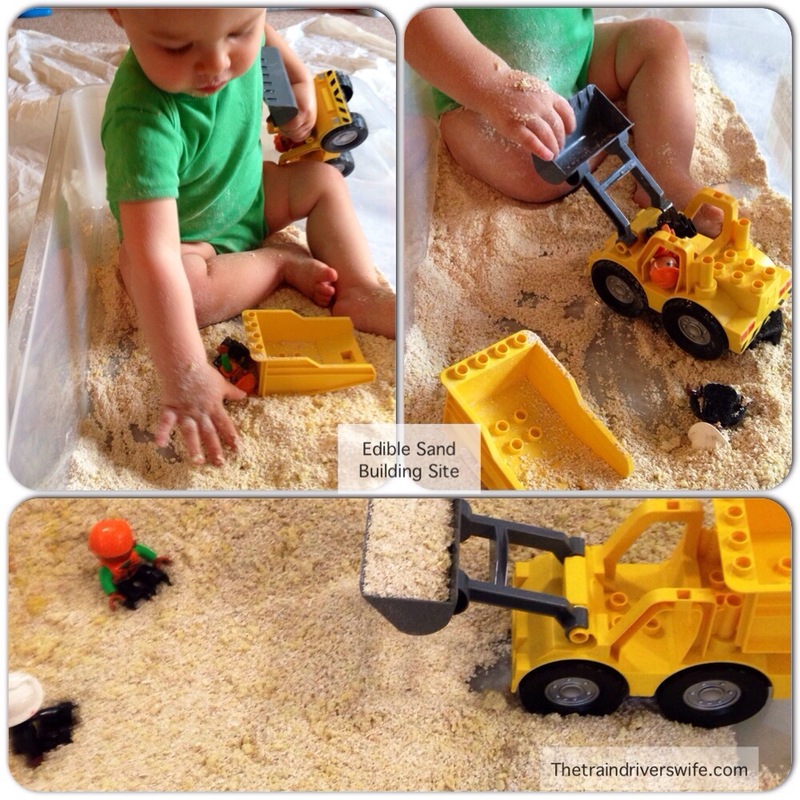 My girls always eat more than play with real sand, so this sounds like a great solution! Glad you enjoyed it! 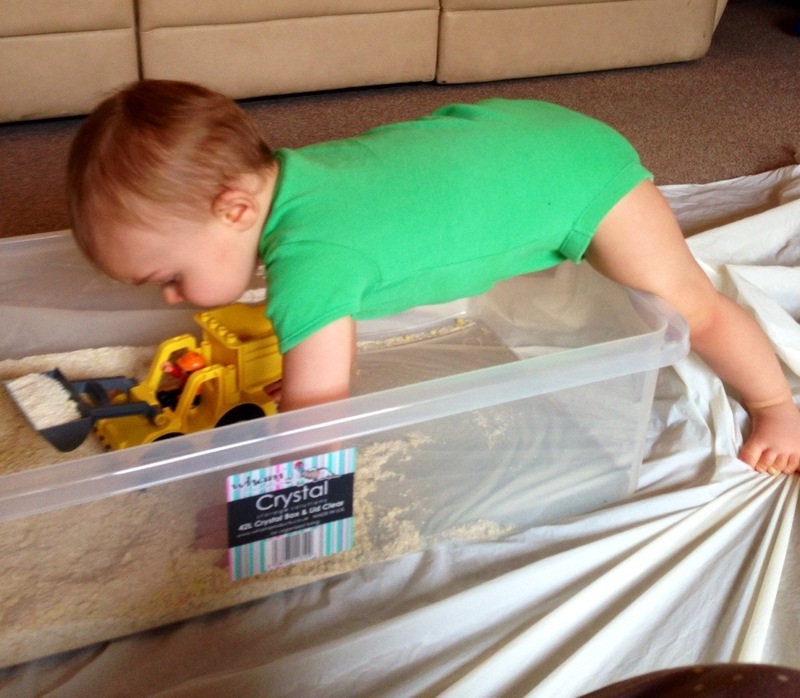 Buddy is an avid sand muncher too so it’s nice to have an alternative! Super idea for kids, who let’s face it, stick everything in their mouth. Oh so true. Yesterday I had to evacuate rocks from Buddy’s mouth! What a brilliant idea for young children. 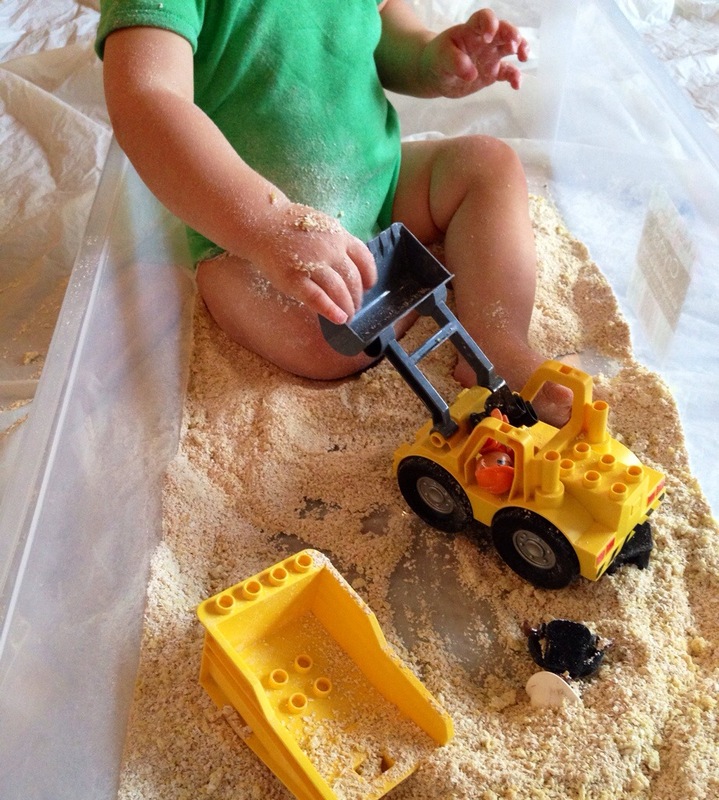 My daughter loved sand play but hated how it ended up in her mouth. This is such a great idea! What a great idea. It really looks like sand. 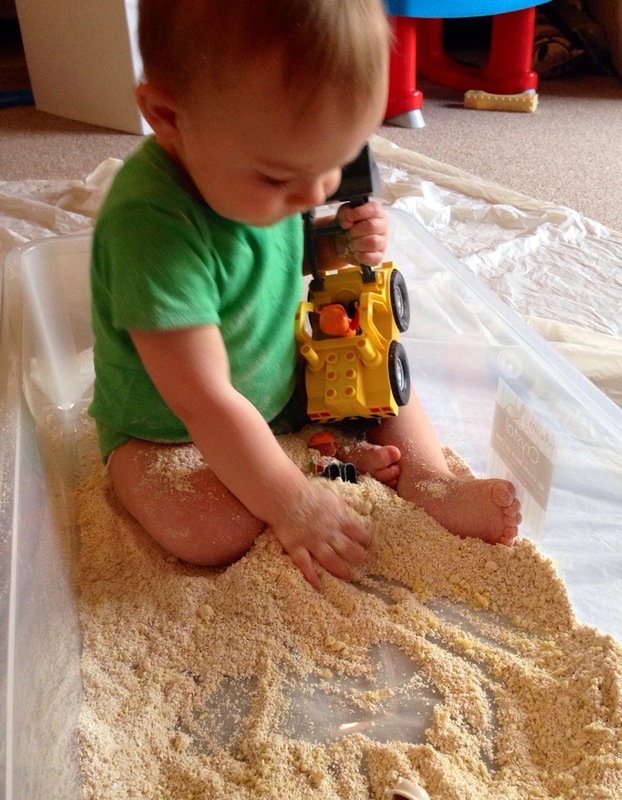 Lovely sensory play and fun. Oh I’m so pleased! Please come back and tell me if he enjoys it! And thanks for stopping by. Thanks so much for visiting and I’m glad you enjoyed it! This is amazing, I never would have thought of making this, i will defo be trying this soon! I’m so pleased you liked it. Please come back and let me know how your little one enjoys it! Thanks so much for visiting. Haha it hoovers up easily fortunately! Oh my goodness! Thank you for the feature! It really was! We loved it and is was so easy to clean up too.